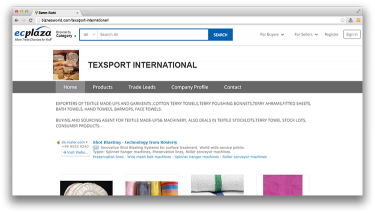 Description WE ARE EXPORTERS OF TERRY BATH ROBES, TERRY TOWELS, TERRY POLISHING BONNETS, TERRY WASH CLOTH, OVEN MIT & POTHOLDER. ALSO DEALS IN COPPER SCRAP AND GENERAL METAL SCRAPS, MINERAL RAW MATERIALS. Address Plot#113, OCHS,3rd floor, Amir Khusro Rd, Karachi.